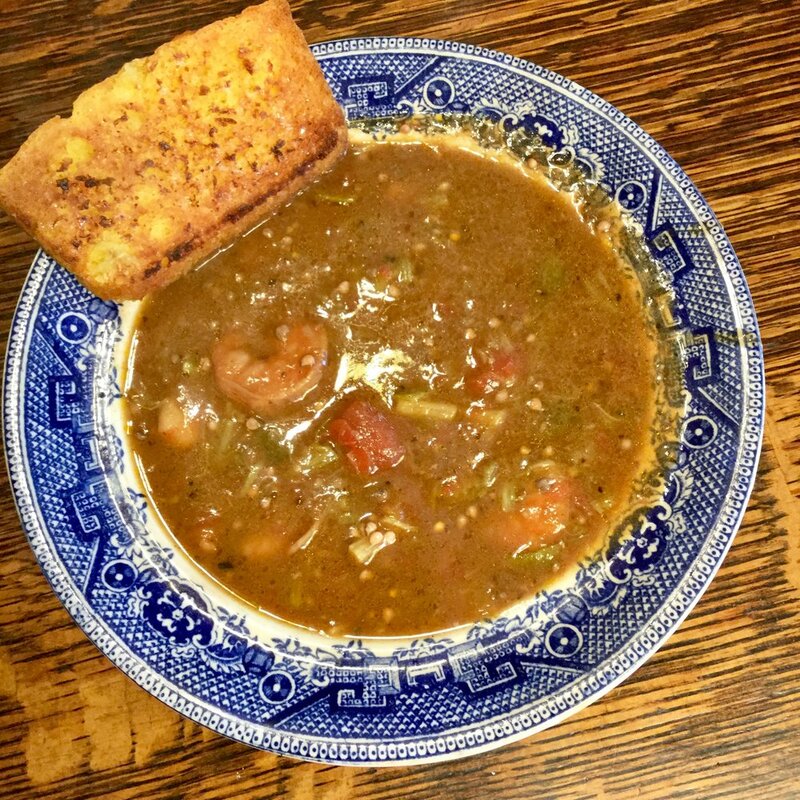 Low Carb Louisiana Shrimp Gumbo. Before the very end of the year I’d like to share my recipe for Shrimp Gumbo. First of all, I’ve never in my life measured anything about this recipe except, of course, knowing how much shrimp I bought. So what I’m saying is, these are all guesses and measurements don’t really matter anyway. I remember years ago before we moved from Louisiana to Maine, MawMaw, my husband’s mother, showed me how to make gumbo in her Hammond, Louisiana kitchen. She always made shrimp gumbo for our Xmas Eve family celebration. Then we moved to Maine, and I started making shrimp gumbo at every Xmas celebration. And then, years later, I became the MawMaw and now we have MawMaw’s Gumbo every Xmas. So here I will attempt to tell you how to make gumbo, and how to serve it low carb, grain free and deliciously perfect. Remember these are all guesses and there’s got to be some magic in there! Stir until all veggies are soft. 4 pounds whole shrimp and stir til they turn pink. Stir in seasonings, taste and correct seasonings. Let cook on stove until all the seasonings blend, probably for about an additional hour. The rest of my family likes rice in the bowl along with their gumbo. I eat my gumbo like the delicious soup that it is, no rice of course. Sometimes I add a good hot sauce to the bowl.